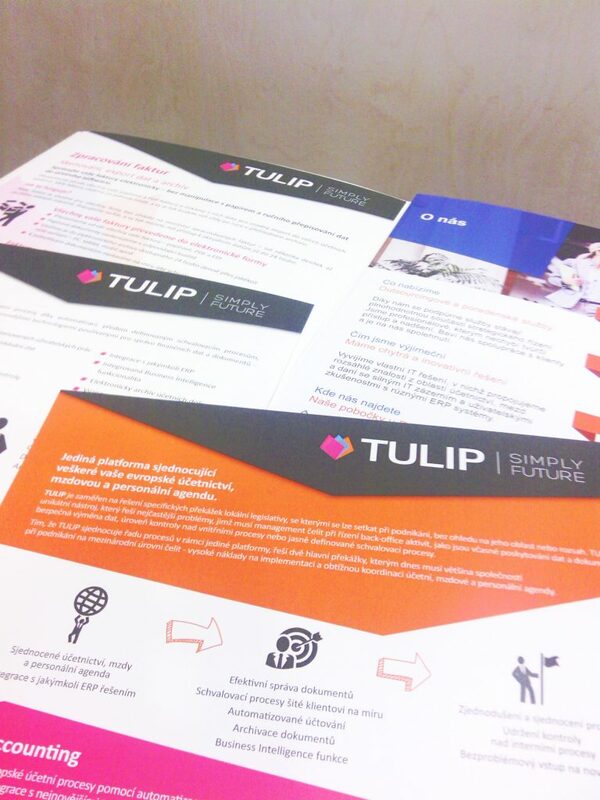 TULIP was a general sponsor for the “Elektronické účetnictví 2016” conference hosted in Prague. How do we feel it went and will we attend the event again? Small conferences for approximately 30 people are our favourite. We can communicate with the audience and they are more eager to ask questions. That is usually our general experience. The EAccount ing conference “Elektronické účetnictví 2016” was exactly this type of event. The main theme was why, and how to do eAccounting, since it is necessary for modern companies in the 21st century. All the lectures focused on this topic and the conference was split into 4 parts. Parts 1 and 2 were led by MVDr. Milan Vodička. Firstly, he spoke about the laws, correct e-documents receipt, the transformation of invoices into electronic versions, etc. Secondly, he focused on IT technologies, systems set-ups, e-document workflows, archives and many more. After lunch, it was our turn. Viktor Mečiar and Jana Vasilenková explained why we decided to start with electronic invoicing and why we needed to develop our own solution for it. TULIP´s lecturers tried to help the audience to understand their opportunities and limitations when it comes to electronic business management. We did this by warning them about the mistakes we made at the beginning and through a case study from one of our clients. We showed them that in the end it was a great decision. Last final was led by Ing. Zdeněk Burda. He spoke about electronic documents management, coordination with the financial bureau and the questionable requirements made by government. For TULIP it was a great experience and we were pleasantly surprised by the audience’s interest and their questions. We will gladly attend next year´s conference, will you join us? Do you want to know the details of document´s digitalization processes? Or data extraction? Let´s talk! Previous Post We are attending the „Informačné technológie 2016“ conference as a speaker! Next Post What was the ‘Cloud for business’ conference like?